Journey to the heart of an ancient land where history and cultures converge. Where timeless sights and mesmerising landscapes combine with a rich culinary heritage and local hospitality to ensure a thoroughly unforgettable experience. Meander through old Roman cities and crusader castles, important biblical sites and haunting modern memorials. Marvel at the extraordinary Nabataean caravan-city of Petra, one of the new Seven Wonders of the World, and wallow in the mineral-laden waters of the Dead Sea. Follow in the footsteps of Lawrence of Arabia across the desert reaches of Wadi Rum and savour flavoursome Levantine cuisine. Arrive into Amman Airport and transfer southeast to your hotel on the shores of the Dead Sea. At 400m below sea level, this is the lowest point on earth! The rest of the day is at leisure to enjoy the facilities and marvel at the uninterrupted views across the vast salt lake towards the west bank. Your touring today starts with a visit to Jerash, a city founded by Alexander the Great and generally acknowledged as one of the best preserved Roman provincial towns in the world, hidden for centuries in the sand before being excavated and restored some 80 year ago. Marvel at the paved and colonnaded streets, hilltop temples, handsome theatres, spacious public squares and plazas, baths, fountains and city walls pierced by towers and gates. Continue to Amman and, after lunch at a local restaurant, explore the modern, bustling city including the citadel and Roman Theatre. Tonight, gather for a festive welcome dinner. B L D | Kempinski Hotel Ishtar Dead Sea. 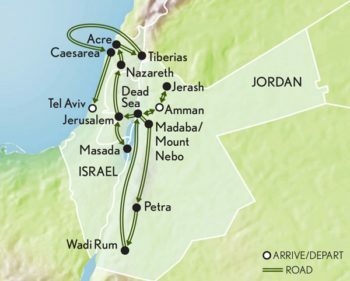 This morning travel south along the King’s Highway, an ancient trade route and important access point for many historic sites. Pas by Mount Nebo, in the footsteps of Moses, for expansive views of the Holy Land. Proceed to the Christian town of Madaba, the famed “City of Mosaics.” Stop for lunch at a local restaurant before continuing to your hotel in Petra. Spend a full day exploring the many wonders of the ‘Rose-Red City’, whose tombs, temples and exquisite monuments are hewn from solid mountain rock. Sights include the Treasury, accessed through the narrow ‘siq’, the Roman Theatre, the Corinthian and Palace Tombs and the Roman Road. Prepare an evening meal with a local chef during a Chef’s Table experience. Travel south to Wadi Rum, setting for the 1962 film ‘Lawrence of Arabia’, with its huge mountains of sandstone and narrow canyons which you will explore on a 4WD excursion. Arrive back at the Dead Sea with time to take an afternoon dip in the mineral-rich waters. The high levels of salt in the water keep the body afloat and the variety of minerals is believed to promote good health. Cross into Israel and drive to the Mount of Olives for a view over Temple Mount (Al Haram el-Sharif). Visit the Garden of Gethsemane, with its ancient olive trees, where Jesus is said to have prayed before his crucifixion. Tour Mahna Yahuda market, enjoying local delicacies for lunch. Visit the Israel Museum’s Shrine of the Book and Second Temple Model to view a portion of the Dead Sea Scrolls. Check in and dine at your hotel’s restaurant. Tour the Old City, first stopping at the Western Wall, one of Judaism’s most sacred sites. View the Temple Mount area with its Dome of the Rock. After lunch at a local café, stroll the Via Dolorosa, where Jesus carried the cross, arriving at the recently renovated Church of the Holy Sepulchre, traditional site of Jesus’ crucifixion, burial and resurrection. As your day ends, view the city’s skyline with a scenic sundowner. Visit Yad Vashem, Israel’s memorial to Holocaust victims before driving to Bethlehem to visit the Church of the Nativity which is celebrated as the birth place of Jesus. Dine tonight at a rooftop restaurant in Jerusalem. Visit Masada, taking a cable car up to the final stronghold, where Jewish Zealots made their last stand against the Romans. Later, stop at the Qumran Caves, where the Dead Sea Scrolls were found in 1947. Return to Jerusalem. Drive to World Heritage listed Acre, the historic walled port-city which has seen continuous settlement since the Phoenician period. Marvel at the Crusader Halls, markets and old town. Journey to Jesus’ boyhood town of Nazareth and, after lunch, visit the Church of the Annunciation. Continue to Tiberias and your hotel. Prior to dinner, experience an artisanal wine talk organised by a professional sommelier. Enjoy a private boat ride on the Sea of Galilee, stopping at Capernaum to view St. Peter’s house and the ancient synagogue where Jesus is said to have taught. Visit the Mount of Beatitudes, site of the Sermon on the Mount. After lunch, drive to the Golan Heights to learn about the rich history and strategic importance of this rugged landscape, before continuing to Banias Springs, source of the River Jordan. Gather tonight for a special farewell dinner. On the Mediterranean Coast, visit Caesarea, ancient capital of the Roman province, where St. Paul was taken prisoner, before exploring vibrant and cosmopolitan Tel Aviv. Later in the day stop at the 4,000-year-old ancient port city of Jaffa with its golden sandstone buildings, bohemian alleyways and emerging art scene. Transfer to Tel Aviv airport for your onward flight. Last group event: arrival in Tel Aviv at 5:30 p.m on Day 12.